Now available on DVD at Amazon.com, Netflix and other fine retailers. January 15th 2007 marked the 60th anniversary of the day that Elizabeth Short was found murdered and mutilated in a lot at 39th and Norton. The murder captivated Los Angeles and set off a media frenzy fueled by the lurid life and brutal death of "The Black Dahlia". 60 years later this crime has still gone unsolved and still continues to captivate not just Los Angeles- but the entire world. 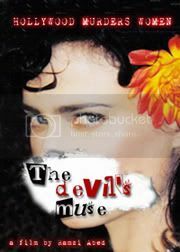 During THE LOST WEEKEND (which was hosted by B.Beretta Unlimted, Ramzi Abed and 1947project), there were 4 screenings of "The Devil's Muse" which started on Thursday, January 11th and ended with the OFFICIAL PREMIERE on January 16th. Many CAST MEMBERS were in attendance as well as several SPECIAL GUESTS. The Premiere screened at the Laemmle Grand 4-Plex in Downtown Los Angeles. Look for more screenings in the near future!